That Michael Lewis came to dinner at our house once. This was about 30 years ago, when he was dating a friend of mine for a while, and before Liar’s Poker made him famous. He was charming – working in finance – but if only I’d known who he’d turn into, I’d have quizzed him closely about his stellar writing technique. I’ve just devoured The Undoing Project, his much-trailed book about Daniel Kahneman and Amos Tversky, and their launching of the behavioural revolution in economics, over two evenings. It’s a wonderful book. I heartily recommend it as a Christmas gift for the economists in your life, or a treat for yourself over the holiday. The book weaves together the personal and intellectual biographies of its protagonists. It explains the ideas, including the paradoxes requiring one to think about probabilities, beautifully clearly. It’s also just a terrific human story about an intense creative friendship as it flowed, and ebbed, over the decades and continents. If they’re not always totally likeable, the two characters are always immensely sympathetic. It will surely send many readers on to Kahneman’s Thinking Fast and Slow, which requires some mental effort but everybody who fancies themselves an intelligent, educated person ought to have read. Although I’ve read loads of behavioural economics books and papers, and so think I know about a lot of the insights the literature has given us about how our decision-making processes function, there were still some new (to me) ones in The Undoing Project. These are two I found. Tversky had a rule that you must wait a day before replying to any invitation, even one you wanted to accept. It becoms much easier to decline the ones you don’t want. This is advice I definitely need to follow. The other comes from thinking about reversion to the mean. An exceptionally (beyond average) good or bad performance is usually followed by one that is less good or less bad (closer to average). Yet coaches and teachers and bosses often hold that if you praise someone for doing well, they do less well next time, and if you shout at someone for doing badly, they do better next time. “Because we tend to reward others when they do well and punish them when they do badly, and because there is regression to the mean, it is part of the human condition that we are statistically punished for rewarding others and rewarded for punishing them,” wrote Kahneman. This strikes me as profound and something one ought to act on. It was surprising to learn that at the height of his fame, in the years before his death, Tversky was bugged by the criticism of their work by Gerd Gigerenzer. I’ve never seen Gigernenzer’s argument that heuristic rules of thumb were rational because they economized on brain energy as a fundamental attack on Kahneman and Tversky, more an extension. There’s surely loads still to be discovered about decision making (especially under uncertainty), not least when decisions are conventionally ‘rational’ versus when ‘behavioural’ behaviour kicks in. As economics is all about decision-making in the domain of resource use and allocation, this overlap with psychology and cognitive science is an exciting area – even though I’m deeply uneasy about the eagerness with which some economists and policy makers are leaping to adopt ‘nudges’ as another handy tool for social engineers to get the people to behave as they ought. We certainly ought to be teaching this at A level and in universities. 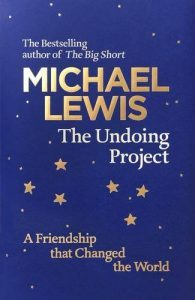 The Undoing Project is a great book to introduce behavioural economics – and a cracking good story, told by a master. Think people who ‘fancy themselves an intelligent educated person’ should read a conan book or perhaps a famous five book. Enjoy the blog but it does come across as quite pretentious. Not really pretentious, just a pointy-head, honest. And we only met ML once, before he was famous. I’m perfectly serious about people who have any position of decision making authority educating themselves about how people take decisions. I’m not. The questions about how reproducible the findings are leave this layperson guessing that the science is just being used to feed the dreams of the scientist. Guess that means I do believe in confirmation bias. Again I do enjoy the blog and appreciate the time you put into it.